With a Bluetooth headset device, you can talk on your Samsung Galaxy S 5 phone without having to hold the phone to your ear — and without any cords running from the phone to your earpiece. You’ve probably come across plenty of people talking on Bluetooth headsets. You might even have wondered whether they were a little crazy, talking to themselves. Well, call yourself crazy now, because when you start using a Bluetooth headset, you might never want to go back. From the Home screen on your phone, tap the Apps icon. This gets you to the list of all the applications on your phone. Flick or pan to the Settings icon and tap it. 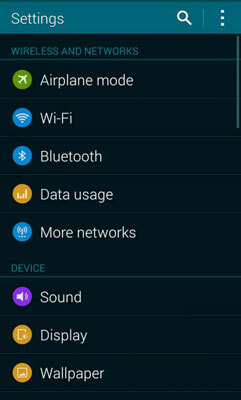 The Settings icon is shown here. This screen holds most of the settings that you can adjust on your phone. If you prefer, you can also bring down the notification screen and tap the gear icon or tap the menu button on the Home screen. All these actions will get you to the same place. Tapping on the Settings icon brings up the screen in the example. Be sure that the green button to the right is set to On. 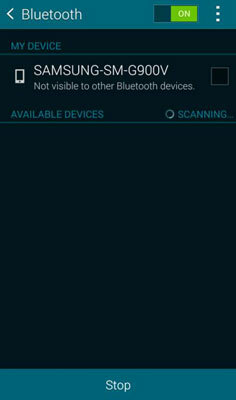 When you open this screen, your phone will automatically start scanning for other Bluetooth devices. This state will last for 120 seconds — enough time for you to get your Bluetooth device into pairing mode so both devices can negotiate the proper security settings and pair up every time they “see” each other from now on. Put your headset into sync mode. Follow the instructions that came with your headset. After a moment, the phone “sees” the headset. When it does, you’re prompted to enter the security code, and the software keyboard pops up. Enter the security code for your headset and then tap the Enter button. The security code on most headsets is 0000, but check the instructions that came with your headset if that number doesn’t work. Your phone might see other devices in the immediate area. If so, it asks you which device you want to pair with. Tap the name of your headset. Your headset is now synced to your phone. If you turn one on when the other is already on, they recognize each other and automatically pair up.